The Fire Weather Research Laboratory is located in the Department of Meteorology and Climate Science's Arnold True Atmospheric Observatory on the top floor of the Duncan Hall of Science at San José State University. The lab is one of the most well equipped fire research laboratories in the United States. CSU-MAPS just arrived at RxCADRE, Eglin AFB, Florida. The CSU-MAPS is a joint facility developed by San José and San Francisco State Universities funded by the National Science Foundation. The CSU-MAPS is the most advanced mobile atmospheric boundary-layer profiling system in the US. Its mobile capability makes it an ideal platform for studying active wildfires in mountainous terrain. The system consists of two remote sensing tropospheric profilers: a scanning Doppler Lidar (Halo Photonics, Ltd, Streamline 75), and a microwave temperature and humidity profiler (Radiometrics, Inc., MP3000). These instruments are mounted in the back of a 2012 Ford F250 4x4 and allow quick deployment. The CSU-MAPS is also equipped with a Vaisala, Inc., MW31 DigiCora Radiosonde System for upper-air soundings. An additional radiosonde system (GRAW Radiosondes GmbH & Co. KG, GS-E) is mounted in the truck to provide mobile soundings anywhere. 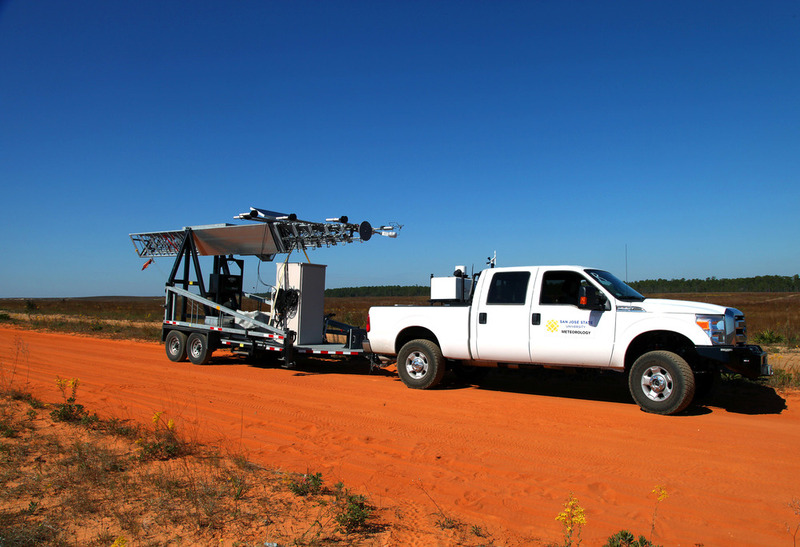 One of the key platforms is a mobile meteorological tower mounted on a dual-axle trailer. The tower is a 32 m (106 ft) telescopic tower with 5 levels of wind and temperature/RH measurements. The CSU-MAPS is the only mobile atmopsheric profiling system capable of monitoring wildfires and fire weather in remote and mountainous terrain.